He handed me a bible. Indeed, inside the bible was my name. 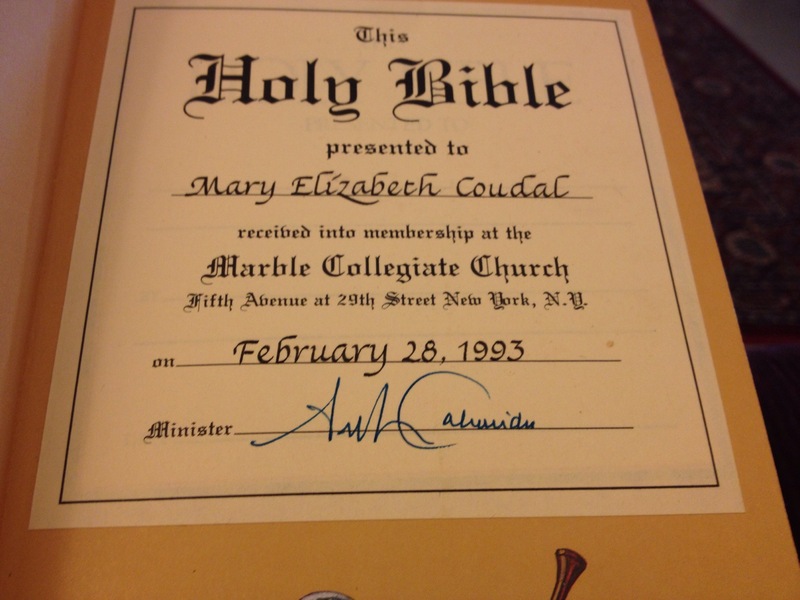 I remember receiving this bible when I joined Marble Collegiate Church so long ago. But I had not brought a bible on this retreat. It must’ve been left by one of my kids when they went to Quinipet camp more than five years ago. What to do? I like the Message version of the bible way better than this old NRSV. Should I see this bible as a gift? Once lost, now found? Funnily enough, at lunchtime, we had been talking about how many books we had — and how we had too many. I chose to leave that old bible behind. So I could find it — and be found — sometime again. and it is not finished with me! 😉 thanks! Great story….it found you and may find you again! and the truth is, the bible had weathered. pages were bent back. it had clearly been used (but not by me!) thanks for comment! I like that you were together again so you could choose to part rather than having been parted with no thoughtfulness.